For simple blogs, you don't need much - a basic computer, a modem for access to the Intenet and a suitable blogging platform. I use the free Google Blogger and use sub-domains of blogspot.com and Blogger host my blogs for free. Very generous of them. I use free photo editors like Irfanview in conjunction with Paint that comes with Windows for screenshots and for editing photos and creating images. Photoshop would be better if you are prepared to pay for it. For taking photos, I use my son's compact digital camera. We somehow lost the cable to upload photos to the computer, so had to buy a card reader to transfer the photos. However, I am not too happy with his camera so intend to get one for myself. However, I am just going to use it for putting photos on the web, so I don't need a high resolution camera. I am not falling for the megapixel trap. I very occasionally make video to upload to Youtube and then use the script to embed into my post. For that, I use a webcam and a headset with microphone and the Windows Movie Maker that comes with Windows. You may want to take outdoor videos, away from the computer. For that, you will need a webcam. You may already have all the items needed for blogging mentioned above, or you may not. Even if you already have them, you may need to upgrade or some of them may become unworkable. I do multitasking and have many browsers opened at the same time (see Why you should have more than one browser and in each browser, have many tabs opened. While I am typing this post, in addition to 4 browsers, I have 38 Notepad files, Irfanview, Paint, calculator, 4 Excel files opened simultaneously. I have recently upgraded to a dual core processor computer as it is said that such computer is better for multi-tasking usage like these. I need to get a digital camera. Comparison shopping is easier online. Having a chance to save some money on the purchases will be great, and Coupon Chief says they can help you do that. There is a search box on their site. Since I am in the market for a digital camera, I typed "digital camera" into the search box and click to search. I got the search result page for digital camera. There was a long list, and the last one was "Clearance Deals". Being a sucker for bargains, I clicked on that link and saw "Canon Sure Shot 65 35mm Point & Shoot Camera - Clearance! - $69.95 Now $32." That $32 was actually a discount and the final price was $37.95. That looked interesting and I proceeded to check out. There were a few choice of payment methods including "Begin Checkout", "Canadian Checkout", "PayPal Checkout", "Google Checkout" and "Bill Me Later® Checkout". Since I have a sizable PayPal balance, I selected "PayPal Checkout". Found out that shipping was "Ground, 3 - 7 Business Days, $16.90" and a message "Guam, Puerto Rico, Virgin Islands, military APO/FPO and PO Box orders are shipped via USPS only. Please note, not all items can be shipped via USPS to these locations, and in some instances, we may be unable to fulfill your order, based upon these restrictions." Based on these information, I did not proceed to complete the purchase, but those who are US residents or residents in one of the locations mentioned may find such deal attractive and a good way to save money. There are other possibilities including Ritz Camera - Digital Cameras & Accessories which list many cameras and accessories and another page Ritz Camera Software for pictures. There is one software which may be f interest to bloggers, and that is "ArcSoft Slide Show Maker Digital Picture Software" selling for $19.99. The page says "Free Shipping (orders over $100*). No Sales Tax" but it will be unlikely I will be purchasing software totalling over $100 unless that statement include items other than software. I will be writing to them to enquire about delivery to my country and hope to remember to update this post if I get a response. We work with Access USA to allow our overseas customers to forward any order to their International address. 1. Sign up for your own U.S. mailing address through Access USA. 3. Access USA will forward your order to you. ANYWHERE IN THE WORLD, whenever you want! Sounds like too much trouble for us non-US residents unless we find something irresistible or unobtainable elsewhere. Blogging platforms like Google Blogger, Wordpress (free version), etc., makes it easy for anyone to start a blog irrespective of background. He or she may know nothing of HTML, CSS, etc., but with the easy interface provided by such blogging platforms, can start a blog under 10 minutes and immediately start publishing posts to the web. If you are a complete beginner, Dummies Guide to Google Blogger can probably help you get started very quickly. It was intended to be an "online book" for beginning bloggers, but I just don't have the time to finish it. However, whatever is already there should be enough to start a beginner off. You can do a lot of things with blogs using such blogging platforms like Google Blogger if you know what to do, but there are limitations. For greater flexibility, you will have to use a suitable Content Management System (CMS). A Content Management System (CMS) is a software system used for management of content including computer files, image media, audio files, electronic documents and web content. There is a whole bunch of Content Management Systems including Alfresco, Apache Lenya, b2evolution, BLOG:CMS, blosxom, Bricolage, CMSimple, Cyclone3, Daisy, Dokuwiki, DotNetNuke, Drupal, e107, eZ publish, Fedora Java, jAPS, Joomla, KnowledgeTree Document Management System, Lyceum, Mambo, MediaWiki, Midgard, Nucleus CMS, Nuxeo CPS, OpenACS, OpenCms, phpCMS, PHP-Fusion, PHP-Nuke, phpWCMS, phpWebSite, PhpWiki, Plone, PmWiki, PostNuke, Post Revolution, Scoop, SilverStripe, SiteFrame, Slash, SPIP, Textpattern, TikiWiki, TWiki, Typo, TYPO3, WebGUI, WordPress, XOOPS and Zope. 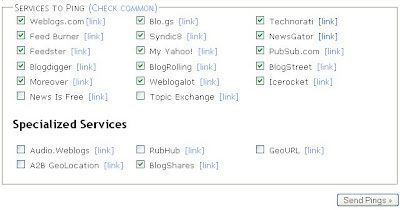 Note that WordPress is included in the list. The above are free and open source CMS. There are quite a number more, some of them costing more than $15,000. Some bloggers uses CMS for their blogs. This allows more flexibility like adding a forum to the blog. I had a blog reader who have to do her blog twice, once in Polish, then again in English. She asked me if there is a possibility of somehow "mirroring" her blog of something. The best I could think of is adding a translator to her blog (click BACK button to get back to this page), but problem is, Both AltaVista Babelfish and Google Translator don't include Polish. If you use Joomla for your blog, Joomla SEO may be able to help you easily do Search Engine Optimization for your blog to bring more free organic traffic to your blog. If you are into e-Commerce or making serious efforts to earn from your blog, you can use their comprehensive e-marketing services which include Search Engine Optimization web design, Search Engine Marketing, Blog advertising and marketing, Social media optimization and Training, either on an ala carte basis or as a package. For more information, refer to their Frequently Asked Questions (FAQ) and help notes. Are static pages or dynamic pages better for search engines? Blogger Beta (now New Blogger) touted its major improvement over the old classic Blogger as New Blogger being dynamic. This means you don't need to republish each time you edit something in the template or change some setting. Just save and the changes will be immediately be reflected on the web. No more having to save and then republish and get that dreaded rotating arrow that sometimes really last forever. Let us get back to the subject matter in this post title. Are static pages or dynamic pages better for search engines? Google Webmaster Guideline has this to say: "If you decide to use dynamic pages (i.e., the URL contains a "?" character), be aware that not every search engine spider crawls dynamic pages as well as static pages." So does this mean that New Blogger blogs are not so search engine friendly as the old classic Blogger? The majority of bloggers, including me want their blogs to be search engine friendly except for a very few minority who don't want their blogs to be found. The authors of Google Webmaster Guidelines should know what they are talking about since that is an official site of Google, the creator of giant most used search engine. This thing about static pages being crawled easier than dynamic pages must imply that while New Blogger have made life easier for bloggers, they may have made their blogs less search engine friendly. Search engine optimization software may have a solution. Their software help create static pages from dynamic pages. So is it feasible to create static pages of New Blogger blog pages which are dynamic pages to make them more search engine friendly? Let us have a look at their Frequently asked questions (FAQ). It appear to me from my understanding of what is stated there, that IF that static pages software is applicable for New Blogger blogs, I will probably have to register a domain and host it myself. But one thing is assuring. They say they are not practicing Black Hat Optimization, something that can get a site banned from search engines. Unfortunately, I am unable to figure out from there if creating static pages from New Blogger dynamic pages is feasible to put on the web, and if feasible, whether it will create duplicate content. After all, Google Webmaster Guidelines says "Don't create multiple pages, subdomains, or domains with substantially duplicate content." I can't figure all this out by myself. I think I will contact Static Page Builder and see if they can help me. Blending the color of your search box to the colors of your website. After you have made a selection, click "Save changes". You can see from the scroll box in the left section that there are other things whose color and font you can change. I have previously published adding site translator to blogs (and normal websites as well) at Add translator to your blog (or website) (click BACK button to get back to this page). One reader also wants to know if she publish a blog in English, how can she attract non-English visitors. The only thing I can think of is to ping non-English as well as English servers each time the blogger creates a new post or updates an old one. Unfortunately, my screen is not big enough to display the other non-English services. You can just see "Japanese" at the bottom of the screenshot. The other non-English service that is not shown is Spanish. It seem to be faster than Pingoat and Ping-O-Matic, but there is no provision to include the feed URL for your blog. I will have to think about which one may be better, Ping-O-Matic or Blogflux Pinger. There are many other pinging services I have yet to check. When I find the time, I will either update this post or more likely post about a different aspect of pinging to include those pinging services. The "Name" (Title) is already added as "Google Site Translator" for you. You can change this to whatever you want or even make it blank. It does not do anything. 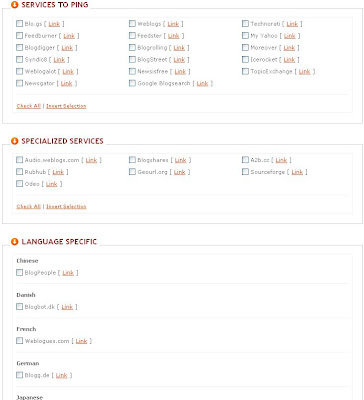 There is also a drop down menu to select the language of your blog. There are only 5 choices, English, French, German, Spanish and Italian. You can also change the text color. The default is #000000 which is the hexadecimal color code for black. If you want, you can change it to other colors to blend with the colors of your site. For this purpose, I find ColorPic to be an indispensable tool (and it is free). If you want the tool, just type or copy-paste "ColorPic" into the searchbox above and tick the radio button beside WEB and search. The site to get ColorPic should be the first result in the SERP (search engine result page). In our case, we should click on "Add to Blogger" and the "pop-up" change where you will see a button "Install Panel". Click on that and you will get a new window "Add Page Element" with a "Select a blog" drop down menu, and when you click the down arrow, you will see all your blogs in that Blogger account. Select the one you want to install the widget in. There will be a box for you to enter the Title. You can make this blank if you want. In my case, I change the default title to "Translate this page". On second thought I think leaving it blank or making it "Translate this site would have been better. Then just click "Add widget"
The Google site translator widget will be added to the top of your sidebar. If you don't want it it that location, hover your mouse over the first Page Element in the sidebar (the cursor will change to a cross) and drag it to wherever you want. In my case, I dragged it to the bottom of the left sidebar. Click "Save" at the top right of the LAYOUT and when saving is complete, you can click "View Blog" to see the result. which tells me that the width of the sidebar 1s 240 pixels. I first installed the Google Site Translator widget into this blog. While logged into Blogger account, I went to the blog World Traveller Guide and clicked on the screwdriver & wrench quick edition icon (highlighted with red circle) for the Google Site Translator Page Element (it is at the bottom of the left sidebar). The blog, Good Health Information demonstrate this. To add this translation, go to Babel Fish Translation. You can translate a block of text or translate a site by typing in the URL of the site. However, if you want visitors to your blog to be able to just click and translate your blog, you will have to click the "Babel Fish Translation" link in . There is a site Scribd that will enable you to embed PowerPoint presentations into your post. An example can be seen at Malaysians have to change attitude to succeed. I shall now describe how I did it. First, you must have a PowerPoint (ppt) file stored in your computer. At Scribd, you can either register first before you upload the ppt file or register first. The advantages of registering is you can edit and delete your uploaded files, view the statistics, make a Profile pages with links to your sites which may help you get more traffic to your sites plus improve the link popularity and PageRank. Browse to your file, click "Upload", then "Publish". After a while, your file will be successfully uploaded and on the left, you will see a box with the script for you to paste into your post editor to display the PowerPoint presentation. Highlight the whole script (ctrl+A), copy to clipboard (ctrl+C) and paste it into the post editor window (ctrl+V). Now you will have to do a bit of tweaking to get the presentation to fit into the post. First find out the width of the main column (posts) of your blog (How to find the width of your blog Header, main column (posts) and sidebar/s. Click BACK button to get back to this page). Now the width of the main column (posts of Guide to Malaysia is 400 pixels while the script generated by Scripd will display a presentation 450 pixels. I will have to do a bit of tweaking to make the presentation fit the width of the post. Note that there are two places where the width and height (highlight in red) in the script. This edited script is then pasted into the post editor, and as you can see from Malaysians have to change attitude to succeed, the PowerPoint presentation fits nicely into the post. I am an avid blogger, and spend most of my waking hours in front of the computer, connected to the Internet. However, I have complained about adverse developments in my country, including threats by the Government to use the Internal Security Act (ISA) which allows detention without trial, against bloggers. I am unsettled by creeping Islamisation with the former Prime Minister and now the current Deputy Prime Minister declaring that our country is an Islamic state despite what is written in the country;s Constitution, plus the Chief Justice talking of abolishing the common law and replacing it with the Syariah (Islamic law). I am feeling highly insecure. I have considered relocating to Hawaii, but the cost of living is very high there. I have also considered Florida where the cost of living is lower. However, I was told the state with the lowest cost of living is Alabama, which is just next to Florida, and whose climate is not that much different. Alabama has a temperate climate with the southern part of the state which is close to the Gulf of Mexico having a warmer weather, while the northern parts of the state, especially in the Appalachian Mountains in the northeast, tend to be slightly cooler. Cost of living is important to me as I am from a low cost of living country and is retired. I understand the median cost of a home in Alabama is about $130,000, which is affordable to me. If I decide on Alabama, I may use real estate to help locate a suitable home at Alabama Real Estate. If I need help in moving, I can help in moving. And if I want to be flexible and keep my option open, I can always look for houses for rent. Sounds viable if only Uncle Sam will allow me to get in. While I was still working, I visited United States of America. The flight ticket was courtesy of MAS (Malaysia Airlines), so I had only to take care of my food, lodging and internal transport. For transport, I used Greyhound buses. The ticket was to Los Angeles. I will like to visit United States again, Previously, I had to fly to Los Angeles via Tokyo Narita International Airport. Now there is direct flight to Los Angeles. I would want to visit United States again. However, there is nothing much to attract me in Los Angeles except perhaps Disneyland Los Angeles. But if it is Disneyland, I would very much prefer Walt Disney Resort World in Orlando, Florida, for they have Epcot there. Furthermore, I was warned about violent crimes in Los Angeles downtown. However, I hear that Los Angeles Downtown has one of the lowest crime rates in the city now. Anyhow, San Diego, not far from Los Angeles, sounds like a more pleasant city to visit with its 70 miles of beaches and a gentle Mediterranean climate. The University of California, San Diego (UCSD) and the affiliated UCSD Medical Center plus research institutes in the Torrey Pines area of La Jolla are very active in biotechnology research, a hot field of study and technology these days. Plus I can just hop over to nearby Tijuana for shopping and end up visiting 2 countries. There is San Diego vacation rentals to help me find accommodation. Florida with its sub-tropical and tropical climate plus Walt Disney World Resort attracts me too. Epcot with its simulated space mission will be of particular interest. Hope I don't get sea sick though. However, there is more to Florida than just theme parks. There is Miami, the cruise capital of the world, plus Miami Beach City and South Beach plus something that should attract my architect brother-in-law who may accompany me - Art Deco architecture. We will need to look for accommodation at Florida vacation rentals. From Miami Port, the largest cruise port in the world, I may take a one way cruise to Hawaii, the paradise of South Pacific. I can partake of the Hawaiian culture and perhaps see Hula (dance) performed in real life. Maybe even get a lei (Hawaiian garland) round my neck. Maybe even find out how the Hawaiian luau is like. Enjoy the beautiful beach and sparkling clear ocean, watch spouting humpback whales, see what a volcano is really like. One way cruise means I will need to get accommodation from Hawaii vacation rentals. After experiencing paradise on earth for a brief period, I will have to fly back to my country, probably across the Atlantic Ocean this time, tour Europe before coming back to my daily routine of sitting in front of the computer practically all my waking hours. I have previous written a long post about my frustration on what is going on in my country and not being able to do much about it except blog. I have talked of my dream about retiring to paradise Hawaii and blog from there. However, that is likely to remain just a dream, for relocation is not an easy thing. I have been sitting in front of my computer nearly all my waking hours since my retirement as associate professor 2 years ago, blogging mainly and doing other stuff. 2 years in front of a computer is a long time. Maybe rather than purchasing a retirement home in paradise Hawaii, I should try to look for suitable vacation accommodation via Hawaii vacation rentals. However flying distance round trip to Honolulu airport is 13620 miles and getting a visa to enter United States is now a real hassle after 9/11. If I take all the trouble to go to Hawaii, I might as well visit other US states of interest. What look interesting to me is Florida, particularly Orlando, the world capital of theme parks with Walt Disney World Resort, Universal Studios, etc., located there. There is also Miami Beach, made famous by the TV show Miami Vice, with its South Beach and its Art Deco architecture. Florida too has a sub-tropical and tropical climate, like my country. No need to bother with winter clothing either. I will book my accommodation online at Florida vacation rentals. I have previously been to San Diego, not far from Los Angeles. It too have mild, sunny weather throughout the year. No winter clothing needed. And it is a short hop to Tijuana, the Gateway to Mexico. I can shop for cheap stuff and tequila there. I don't need to stay in Tijuana as it can be just a day trip from San Diego. I will get my accommodation in San Diego via San Diego vacation rentals. To visit all these places will take quite a number of days. Wonder if I really can stay away from blogging and the Internet that long. Maybe there are cheap Internet cafe I can use. The mainstream mass media (newspaper, radio, television) is tightly controlled by my country's Government. Newspaper need to renew a license every year and the license can be revoked anytime without any reason given. My daughter recently spoke to a journalist who confessed they have to practice self-censorship to survive. Much of the negative news never make it to the press and the Government used to have the monopoly on the "truth", that is, until now. Many residents, including journalist, frustrated at their inability to expose wrongdoings and corruptions, have turned to blogs. Many of these blogs are not anonymous and many of their exposes are backed by documents. Yet bloggers are called liars by the authorities and because their monopoly on the "truth" have now being broken, they have resorted to directives to the mainstream media not to publish any materials from blogs and a Minister have threatened to use the Internal Security Act (equivalent to the US Patriot Act) which allows detention without trial) against bloggers. My country have been blessed with many things including rich natural resources, but there are many things going on that I and many others are very unhappy about, and other than blogging about it, is unable to do anything to change the situation. Is it any wonder that I have aspiration to change my place of residence and continue to blog from another place? Of all the places in the world, Hawaii seems an attractive candidate. In the first place, it has warm, breezy weather much like my country. The breeze will probably makes the high humidity much more tolerable. It has beautiful beaches, sparkling ocean ideal for swimming, snorkeling and scuba diving. More important, it has good Internet access including 24 hour broadband. Unlike my country, there is no official racial or religious discrimination. It is multi-racial and there are Chinese there which will help me feel at home. It is as close to Paradise to me as any other places on earth. I will very much like to relocate to Hawaii and continue to blog from there and escape the oppressive situation here. Obviously, if I do that, I will need a place to stay. Hawaii real estate seem like a good place to start my search. Hawaii consists of eight main islands of which Maui is the second largest with a fast increasing population. The main reason attributed to this population increase is many who have visited the island decided to settle there. It must be an attractive place to live for them to make this important decision. Reinforcing that view, Maui, especially Wailea, is a magnet for celebrities like Paris Hilton, although celebrities watching is not what I would consider my cup of tea. I would very much prefer to sit in front of my computer and blog. If Maui is not too expensive, it will be my choice for settling in, in which case Maui real estate will come in handy. There is another island that attracts me - Kauai, the fourth largest island of Hawaii. It is rightly referred to as Hawaii's Garden Isle with its its fabulous tropic landscape encompassing thousands of flower and bird species. The beautiful scenery have attracted film makers and famous films like South Pacific (Bali Hai), Lilo and Stich, Jurassic Park, Raiders of the Lost Ark, Six Days Seven Nights, remake of King Kong and many Elvis Presley films were filmed on location there. Slow, controlled and high-quality growth is ensured by Kauai's strict zoning laws.The crime rate is low. There are a number of hospitals on Kauai including The Mahelona Medical Center has special programs for the aged and disabled, which appeals to me who is now 58 years old. If I ever relocate to Kauai, I will probably use Kauai real estate to find a roof over my head. How to get a good PageRank? Yes, how can one go from no PageRank to a PageRank of 5? Before I answer that, for those who don't know, you can easily get the PageRank of a site: refer to How to get the PageRank of your blog or any other sites. When a blog is first started, it is given no PageRank, not even zero. Keep writing good, useful and interesting content that surfers will like to read. That is number one. You have heard the phrase "Content is King". Get as many inbound links, also called backlinks (links on other sites that point to yours) as possible. When people find your blog useful or interesting, they will naturally want to link to your site without you even asking. Other ways are to submit to blog and other directories. One on the best directory to submit to is DMOZ (Open Directory Project), but it is not easy to get listed in DMOZ and usually takes a long time. Refer to DMOZ, the most important directory, and Blogger Tips and Tricks got listed without even submitting. It is more advantageous to you to get an inbound link from a site with a PageRank higher than yours. There are a whole bunch of blog directories you can submit to. You can find them by typing or copy-pasting "blog directory" into the search box above, tick WEB and search. Before you start submitting your blog, it is good to prepare a "Directory Submission File" (don't know what else to call it). Open a Notepad file, Type or copy-paste the URL of your blog into the file plus the blog title, a description of your blog. Prepare 2 - one long and one short. This is because some directory have a small characters limit on the description, some have bigger limit, and some may have none. Get ready also a list of keywords (tags) related to the content of your blog. These are the information normally requested by the blog directory you want to submit to, and you wouldn't want to keep repeating the same action over and over again. With this file, you just copy and paste. Some directory require you to put a link to their site on your blog, others don't. If a directory require you to link them, you will have to decide whether you want to do that or not. Here is one very easy directory to get listed in with no requirement for a link back: My Blog Directory. Just go to the bottom of the directory and click "Add your blog", then follow the instructions. Write articles, submit to sites offering free articles for republishing. To find these sites, just type or copy-paste "copyright free articles" into the search box above, tick WEB and search. At the bottom of the article will normally be a paragraphs where you provide information about yourself and give the URLs of the site you want the people who republish your article to link to. In this way, you will get many inbound links (backlinks) because the condition for republishing the article is that the links must be made active. However, this will involve work on your part, but is is a one time thing. Some bloggers resort to link exchange with other blogs. You can request for link exchange on forums or emailing direct the owner of a site, or making a comment in the blog. Remember, however, links should preferably be from blogs that are relevant to the content of your blog. Most are of the opinions that this will help your PageRank, but there are some who think they may not be beneficial. What is without doubt, one way link more beneficial than a link exchange. One very important thing: DO NOT LINK TO SITE CONSIDERED BAD NEIGHBOURHOOD. Bad neighbourhoods are sites that use dubious SEO tactics (black hat SEO), such as hidden text (making text invisible by making the font color the same as the background) or link farms. I myself do do link exchange and usually a request for a link exchange is politely turned down unless it is a link to a relevant and useful site. There are sites that offer to link you for money. Usually, the higher the PageRank of the site, the more it will cost you to purchase a link from that site. I do not know if sites that offers links for cash are considered link farms or not. I do not buy links. This probably will not affect your PageRank, but if you don't update your blog, you will find hits coming from search engines getting less and less. Note: Search engine rank pages and not blog. Most of the time when people talk of the PageRank of your blog, they are referring to the main (index or home) page. Each individual post page or permalink have their own PageRank. New Blogger template: add picture to sidebar. There is now (it has been available for quite some time already) an easier way to do it. Sign into Blogger (Dashboard), click LAYOUT for the relevant blog, click ADD A PAGE ELEMENT in the sidebar section, in the pop-up, select Picture (see screenshot). Click "Add to blog" and then either click "Browse" and locate the picture you want uploaded or if it is a picture already hosted on the web, type or copy-paste its URL into the relevant box. Now you can easily add Title and Caption for the picture. To ensure that the picture fits the sidebar, it is advisable to tick "Shrink to fit", otherwise you will first have to resize your picture to a size suitable for the sidebar and save it to the computer before you "browse" to the resized photo. Once all that is done, click "Save changes" and wait for the photo to be uploaded. The only drawback to this method is that you do not have the option to make the picture clickable (a hyperlink) unlike the method described in the post New Blogger template: add picture to sidebar.